HBNO™ Angel Breathe is a proprietary blend of oils designed to increase the lungs capacity to breathe and clear the sinsues. Highly recommended. HBNO is an excellent addition for any health conscious individual. HBNO™ Angel Breathe essential oil blend is a quintessential addition to health and cleansing applications. 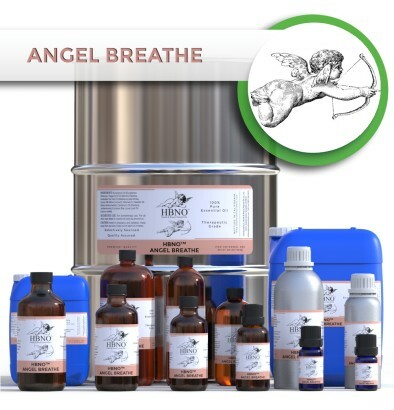 HBNO ™ is pleased to offer HBNO™ Angel Breathe essential oil blend in small packing to bulk and wholesale quantities. We can supply any amount of oil to anywhere in the world. We can also formulate according to your needs to meet your target price for bulk quantities. Peppermint self-hybridized in the 17th century. It grows wild throughout Europe, North America, and Australia.The United States is the largest supplier of peppermint oil, producing more than 80% of the world’s supply. Tea tree is a multi faceted plant that traces its roots to the Aboriginal people of Australia. For over a thousand years they used the leaves as an antiseptic and antifungal by crushing the leaves and making a mudpack. The plant was given its name “tea tree” in 1770 by British explorer Captain James Cook and his crew. The plant's medicinal properties remained unknown to the world until the early 1920s when Australia chemist, Dr. Arthur Penfold, researched its antiseptic properties. During World War II the Australian government considered tea tree a quintessential component of first aid kits. Tea tree essential oil has strong anti inflammatory and antiseptic properties which easily penetrate the outer skin layers to treat insect bites, cuts, burns, acne, infected wounds, bruises, boils, scabies, lice, hives, poison ivy and oak, and sunburn. Tea tree essential possesses analgesic properties that can be applied for sprains, arthritis, bunions, bursitis, eczema, gout, carpal tunnel syndrome, and hemorrhoids. It also assists cold sores, herpes, nail infections, asthma, bronchitis, acne, and blemishes. It also acts as an immune stimulant, helps with athlete's foot, reduces dandruff, ringworm, upper respiratory infections, varicose veins, and parasites. Lemon is indigenous to Southeast Asia, but in the second century was introduced to Greece, then Italy, where it quickly adapted to the Mediterranean climate. is now widely cultivated in Italy, Australia, and California. Christopher Columbus introduced the citrus to the New World in the late 1400s. the oil is popular in cleaning agents and colognes and is widely used in aromatherapy. Lemon essential oil works well on oily skin and general impurities. It’s astringent properties reduce cellulite, obesity and tightens sagging, lackluster skin. It helps with acne, mouth ulcers, varicose veins, arthritis, muscular aches and pains, rheumatism, joint swelling, poor circulation, throat and respiratory ailments, and gout. Lemon essential oil also boosts the immune system by clearing lymphatic congestion, preventing contagious illnesses. The scent of lemon essential oil was shown to be anxiolytic, meaning it works to reduce anxiety and uplift mood. Studies have also shown lemon essential oil to be conducive to memory retention and focus. Lemon essential oil antirheumatic, antioxidant, antiseptic, antispasmodic, antitoxic, astringent, bactericidal, diaphoretic, diuretic, febrifuge, hypotensive, antifungal, insecticide, tonic, immune stimulant, antiviral, and anxiolytic. Fir needle essential oil is a refreshing and powerful oil that rejuvenates the fatigued person whether it be mental, physical, or sexual. It is an effective oil to be diffused throughout the air to purify and rid the area of unwanted viruses and bacteria. It is also effective as a cleansing agent for kitchens and bathrooms alike, imparting a crisp piney scent. It is reputed to assist with asthma, bronchitis, colds, flu, sinusitis, prostatitis, arthritis, gout, sciatica, neuralgia, muscular soreness, psoriasis, insect repellent, eczema, ringworm, sore throat, and fever, and lethargic tendencies. Fir needle essential oil is antiphlogistic, antirheumatic, antiseptic, anti neuralgic, antiviral, antiscorbutic, deodorant, decongestant, diuretic, disinfectant, expectorant, stimulant, tonic, and antifungal. Cardamom has been used in Eastern medicine for over 3,000 years, mentioned in the Vedic medical texts as “Ela.” In India cardamom is considered a powerful aphrodisiac. Cardamom is used in the Tibetan medical preparation “Aquilaria A,” whose fumes are inhaled for stress, anxiety, and nervous tension. Cardamom essential oil soothes muscles, counteracts nausea, assists overcoming sexual weakness, acts as an insect repellent, promotes sensual sentiments, disinfects, and helps with digestive issues. Cardamom essential oil is antispasmodic, reduces nausea, anti septic, anti microbial, aphrodisiac, astringent, digestive, stomachic, stimulant, diuretic, and assists with chemotherapy recovery. Laurel leaves have been in use since antiquity. A wreath of Bay leaves would be crowned upon Greek poets, heroes and victors, especially at the Olympics. Asclepius, the Greek god of medicine was depicted crowned with bay leaves. The incense of laurel leaves were also used by Delphic priests to bring forth clairvoyance and prophecies. Laurel leaf essential oil helps to reduce pain in muscles and joints. It also helps with scalp and hair issues and assists with blood circulation. It is a very powerful oil with strong antiseptic qualities, making it particularly effective at cleansing wounds and purifying the air. Laurel leaf is a stimulant to the lymph, sinuses, lungs, and circulatory systems. It is also reputed to improve memory. Laurel leaf essential oil is anti inflammatory, antiseptic, antibiotic, analgesic, anti-neuralgic, astringent, insecticidal, analgesic, antibacterial, antifungal, antimicrobial, antirheumatic, antiseptic, aperitive, carminative, diaphoretic, diuretic, and sedative.